An Energy Performance Certificate consists of two main parts. The first gives your property a grade from A – G for how energy efficient it is, with “A” being the most efficient and “G” being very inefficient. An average home is thought to be a D.
The second part of the certificate provides suggested ways to make your home more efficient – things like draught-proofing, insulating your loft, replacing your boiler, getting energy saving light bulbs and so on. These measures will improve your homes performance rating as well as saving you money. Finally, the certificate will indicate what rating you could potentially achieve. So for example, your house may be rated as “G” right now, but could make it up to a “C” if you implemented all of the suggestions. Bear in mind that you do not have to follow the suggested measures, but doing so could save you money and make your property more attractive to potential buyers or tenants. You can see what an EPC looks like below, or download a bigger, more detailed pdf example here. 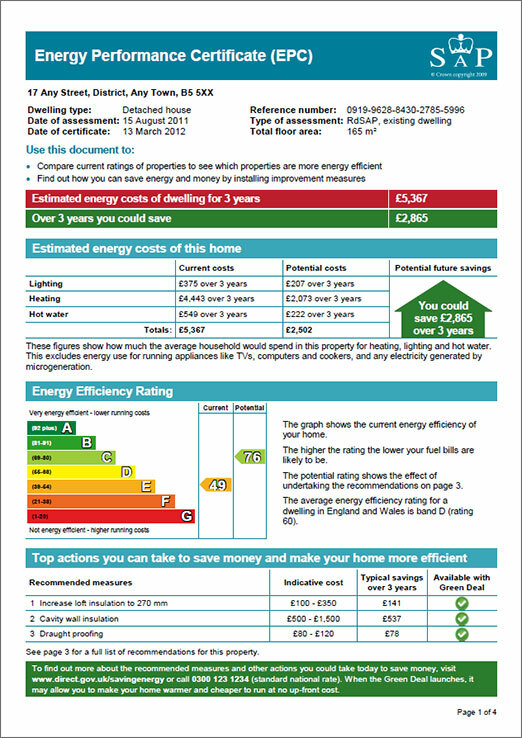 An example of an Energy Performance Certificate. Click here to download a more detailed pdf version. Whenever a property is put up for sale or to let, it must have an up-to-date Energy Performance Certificate. Landlords should also note that by 1st April 2018, all rented properties must be rated “E” or above. If it falls below grade E, then you simply won’t be able to let it out until improvements have been made. 2018 may seem like a long off, but this date could be brought forward, so best get your act together now! There are a number of very cheap (or free) energy saving measures over on our products page. An EPC is provided by an energy assessor who will charge a fee. The cost can vary greatly depending on a number of factors, the main one being the size of the property, along with its location, the property type, and current demand. Depending on who we asked, the price ranged from £35 – £100. The certificate lasts for ten years. Remember this — about 27% of the UK’s CO2 emissions come from domestic homes. We could cut a huge chunk out of that figure if we all did simple things like getting loft or cavity wall insulation (did I mention that it’s free?). Or, if you’re feeling a little more ambitious why not look into PV solar panels. So there you have it. If you are planning on buying or renting a house, make sure you ask to see it’s EPC. And if you have a property that you may sell or let out in the future, then you have six year maximum to get it up to standard. View all of our energy saving products over here.